Thought to have been made for Anne, Countess of Warwick and daughter of Richard Beauchamp, Earl of Warwick (1382-1439), this is the only illustrated biography of a secular figure to have survived from the late middle ages. Richard Beauchamp was a true high-flyer, but his daughter married Richard Neville ('The Kingmaker'), who opposed Edward IV and so caused the exclusion of Anne from all her possessions after his death. It is believed that, to help recover the family's reputation and property, Anne had the 'Pageants' written, probably from an account kept by the family and possibly under the supervision of John Rous (Beauchamp's chantry priest at the Collegiate Church of St Mary's, Warwick), and the extraordinary illustrations made by a Continental artist (known as the Caxton Master) to enhance further the glorifying message. The Caxton Master was skilled at creating dramatic pictures full of realistic details, to impress the viewer with Richard's courage and to convince anyone of the truth of his exploits. 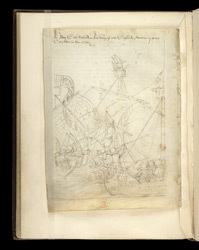 In this illustration, the Earl, returning from a visit to the Emperor, fights off an attack at sea. Like a white hat, the Warwick emblem, the bear holding a ragged staff (on the ship's banner, left), identifies Richard's side. Archers line up on deck to wield inexorable defense, and an ingenious man up in the crow's nest gets ready to drop a stone on the enemy. The diagonal lines and closely packed figures build up the excitement.